We all have our stories to tell of where we were the morning of September 11, 2001. This is one of them. In “That Day In September” Artie Van Why gives an eyewitness account of that fateful morning. From the moment he heard “a loud boom” in his office across from the World Trade Center, to stepping out onto the street, Artie vividly transports the reader back to the day that changed our lives and our country forever. 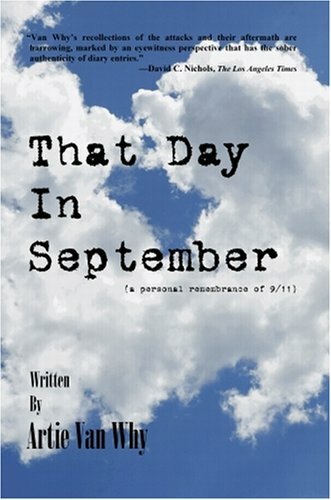 “That Day In September” takes you beyond the events of that morning. By sharing his thoughts, fears, and hopes, Artie expresses what it was like to be in New York City in the weeks and months following. The reader comes away from “That Day In September” with not only a more intimate understanding of the events of that day, but also with a personal glimpse of how one person’s life was dramatically changed forever. I’ve been meaning to read this for a while; I’ve had it for a while, but somehow I just kept not doing it, without intentionally avoiding to. A few nights ago, during my usual bouts of insomnia, I watched another documentary about 9/11. I’ve been watching these sort of documentaries for years already, just like everybody else, but it’s always the same things that get me crying, almost hysterically. Anyway, after a few intense cry sessions, I felt I was ready. I picked it up and read it. It was fast, it hit hard, and it was incredibly touching. I find that it’s very tough to focus on the book itself, because the story, painted in clear and simple lines, gets a whirlwind of emotions going through you, and you’re irreparably focused on the tragedy itself, and on Artie Van Why‘s feelings. This book is a perfect portal to a world of emotion. I liked the clarity of the author’s writing style. The precise, clear focus on simple day-to-day life, that aims straight at your heart. Images of the towers themselves, smoky wounded giants, paint a picture that somehow still escapes my comprehension – I always feel incredibly overwhelmed, stunned when I see them, and it’s more of a thought short-circuit; but images of people, of the Flying People, those hurt me like I can’t put into words, just like seeing relatives or spouses talk about their lost ones does. That level of human loss and pain, that’s the one that always touches me the most. It’s this kind of perspective that Artie Van Why brings to things, and I feel it’s a very inspired one. I find that the author offers a truly heart wrenching, moving tribute to the deaths and losses of 9/11, and beautifully emphasizes the need and difficulty of the healing process. I encourage you to give this short book a read. It’s special, and as real as anything could ever feel. It’s beautiful.